We are discussing about wind energy in several topics highlighting, its uses, advantages, disadvantages etc. Let us discuss few facts about it so as to club all under a head. We have made it a point that facts relating wind energy studies, wind farms, wind related jobs and investments, etc are discussed under sub heads. 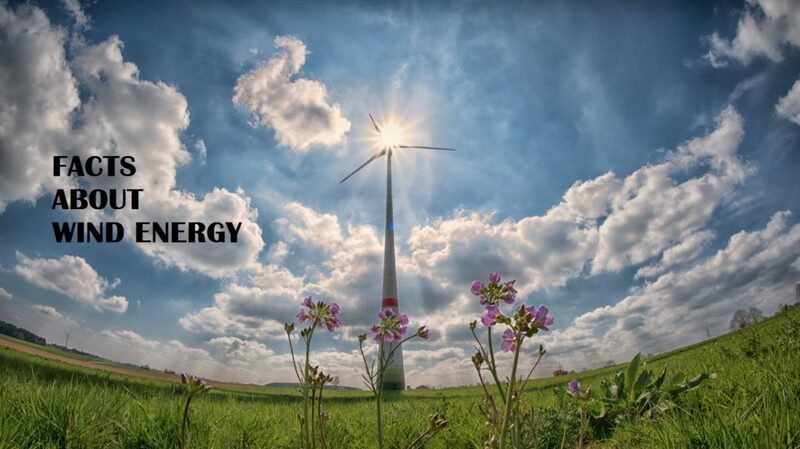 Wind energy or the energy in moving air is a clean and renewable source of power. Since the turn of the last century technological advancements in designs of wind turbines and government subsidies have been instrumental in increasing the use of wind energy for generating electricity. This is so important in these days when countries are trying to reduce their dependence on fossil fuels and minimise their carbon footprint while their electricity requirements increase. Wind is the movement of air. It is dependent on the uneven heating of the atmosphere by the sun. The topography of the earth’s surface, its vegetative cover and the earth’s rotation are some of the factors that determine the speed and direction of winds. Wind speed is greater and more regular at higher altitudes than near the surface of the earth. Also winds at sea are more regular and stronger than onshore winds. Average onshore wind turbines can power 1500 households. An average offshore wind turbine can power 3312 average households. Wind energy is a great alternative to fossil fuels being a renewable source of energy. There are no carbon dioxide emissions at wind farms or power plants. It is also unique because it does not require water in any form during power generation. Heron of Alexandria in the first century, a Greek engineer and mathematician claims the earliest account of using a wind driven wheel. Daniel Halladay “father of the American Windmill” invented the self-regulating wind pump in 1854. His version was seen throughout Argentina, South Africa and New Zealand. Prof James Blyth of Scotland, in 1887, built the first cloth sail wind turbine for electricity generation. It generated enough electricity to light up his home. Charles F. Brush in Cleveland Ohio built the first large scale wind turbine in 1888 in the US with a gear box. William Heronemus “Father of modern wind power” and the inventor of the wind turbine array, wind ship, wind furnace and offshore flotilla ideas- In the late 1960s he correctly predicted a future energy crisis and had a vision of the grand scale of renewable energy development. Vestas and Siemens Wind Power are Danish manufacturers that supply a substantial share of wind turbines around the world. There have been many advances in wind turbine technology since the first wind turbine was built in 1887 in Scotland. In the US the first one was built by Charles F. Brush in 1887 in Cleveland Ohio. It was considered a giant. Its rotor diameter was 17 meters and had a 144 rotor blades made of cedar wood. Its capacity was 12kW and ran 20 years. The appearance of wind turbines and their operations are vastly different today. One Gigawatt wind power plant is about the same output of a new large natural gas plant. The average capacity of a wind turbine is 1.9 megawatts. The average rotor diameter is 99.4 meters. Fibreglass with a hollow core is the most common material used to make the blades. Wooden blades are solid. Other blades have a skin that is either hollow or filled with a light weight substance such as plastic foam or honey comb or balsa wood. Wind turbines with three blades have better balance than that with two blades. Some wind turbines have the appearance of an egg beater. The newest version of windmills does not have rotor blades but are shaped like slim inverted cones, almost like a ‘Joint’ facing the sky. Designers are always designing taller turbines with longer blades. This is because more energy is produced when wind comes in contact with more surface area of the blade. The largest wind turbine is in Gaildorf, Germany. It stands 178 meters tall and the length of a blade is 68.5 meters. It is one part of a quartet of turbines expected to produce an average of 10500 Megawatt hr. every year. One may have seen wind turbines grouped in rows on a flat land or on gently rolling hill spaces. These are called wind farms. Earlier these were seen on land, but now they are seen at sea too. These are onshore and offshore wind farms. Wind farms take up huge areas of land. They are usually located near ecologically sensitive areas with diverse habitats. Wind power plants are regional in the US located mostly in Texas, Iowa, South Dakota and Kansas, Oklahoma and California. Most of the states in the central plains have 10 % of their generation coming from wind power. These include North Dakota, South Dakota, Minnesota, Iowa, Nebraska, Colorado, Kansas, Oklahoma, New Mexico, Texas, Maine, Vermont, Oregon, and Idaho. The first offshore wind farm in the US is the Deep water Wind Project off the coast of Block Island, Rhode Island. Consisting of 5 turbines with 240 foot long blades, it is a modest 30 megawatt project that started operations in 2016. The Alta Wind Energy Centre in California is the largest wind farm in the US with a capacity of 1548MW. Offshore turbines are anchored to the sea bed at depths of 30 meters. Floating offshore turbines have anchors that fix to sea beds at 60meters. Birds and bats are killed when the blades spin. This has led to concerns for species that are being endangered by turbines. Some people find the appearance of wind farms ruin the pristine landscape on which they stand. The wind industry has produced more jobs. These are available from research to manufacturing to installation to maintenance. Building up a wind turbine or wind farm also requires civil and electrical works. In the US alone, 73000 well-paying jobs are supported by American wind power. This includes 20000 manufacturing jobs. According to the US Department of Energy, if the industry stays on track to provide 20% of US electricity by 2030, wind energy could support 380000 well-paying jobs. Wind energy has great potential not only to provide electricity but also to raise economies. It has been accepted and is being widely implemented all over the world. In our efforts to control global warming, wind energy is one of the good tools to combat it.